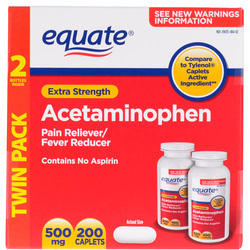 Acetaminophen is also known as tylenol. Acetaminophen is useful as an analgesic and anti pyretic medication. Acetaminophen is useful as an alternative to children who may develop Reye’s syndrome due to aspirin or NSAIDS. Acetaminophen will inhibit the action of cyclooxygenase 1 and cyclooxygenase 2 (COX1 and COX 2) in the central nervous system which will finally lead to decrease in the synthesis of prostaglandin in the central nervous system. As a result there will be a decrease in the pain sensation / analgesic and development of the anti pyretic effects. Acetaminophen poisoning may occur. In this case, acetylcysteine is useful as an antidote which able to bind and inactive the toxic metabolites forms by acetaminophen through the binding of the sulfhydryl group. The common side effects of acetaminophen are renal damage, dizziness, fatal hepatotoxicity and transient liver enzymes elevation.